How many dinosaurs have you heard of? How many could you name? This book is a kind of pictorial dictionary of 199 of them! 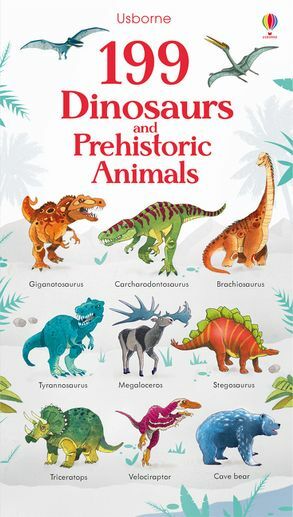 199 Dinosaurs and Prehistoric Animals has a sturdy hard cover, thick board pages, and is a comfortable size for small hands -- the kind that belong to little dinosaur lovers. The animals are divided into categories like powerful predators and huge herbivores. Each category has a page full of labelled, colourful dinosaur pictures. Learn the names of all the dinosaurs with horns or spikes (there are 23 of them listed). Discover ice age animals like the Shaggy Musk Ox, Ground Sloth, and the Smilodon. Test yourself and see if you know which dinosaurs get around on two legs, or which ones are small and speedy. Prehistoric animals that lived under the sea are included, as are those that lived in swamps, or spent much of their time in the air. The back cover of 199 Dinosaurs and Prehistoric Animals has a link or QR code you can follow to find an interactive list of the dinosaur names and audio to hear how to say them. It's a really handy tool for parents reading to their kids or answering their questions! 199 Dinosaurs and Prehistoric Animals is a book that definitely belongs on the bookshelves of any family with children curious about dinosaurs.